hours, the route is the fastest direct ferry service to northern Spain. On board you can enjoy award-winning service and top-class facilities, including gourmet restaurants, stylish lounges and comfortable cabins. You'll arrive completely relaxed, and ready to begin your holiday in Spain. Monday 6th: We arrive in Santander early afternoon ready to make the short drive to the Hotel Juan de la Cosa and the start of our 4 meal a day all-inclusive package. Tuesday 7th: Free day at resort to enjoy the beautiful sandy beach and hotel facilities. Thursday 9th: This morning we head to Santander with time to explore. Largely rebuilt in 1941 after the great fire it still has all its former charm and is an elegant city with great shops, bars and restaurants. Friday 10th: Full day travelling along the Cantabrian coastline stopping at the beautiful and enchanting villages of San Vicente de la Barquera, Comillas and the world heritage site of Santillana del Mar with its medieval buildings and cobbled streets. 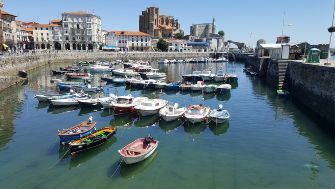 Saturday 11th: Full day excursion to Castro Urdiales, a small and charming resort, the old town is relatively unspoilt and also the coastal town of Laredo. Sunday 12th: Free day at resort. Monday 13th: Morning departure as we head back along the coast to Santander. We board for our overnight sailing back to the UK departing Santander at 3.15pm. Tuesday 14th: Arrive back at Portsmouth or Plymouth mid-afternoon and travel via the motorways home. Close to Berria's beach, offers magnificent views of a natural privileged environment. Comfortable and hospitable rooms with all that you need: bath, hairdryer, TV, strong box, telephone and air - conditioning. Additional facilities include air - conditioned swimming pool, jacuzzi, sauna, gymnasium. Comfortable lounges are equipped with computers, connection to Internet, magazines, books, etc. There are steps into the hotel.